Comeback complete! 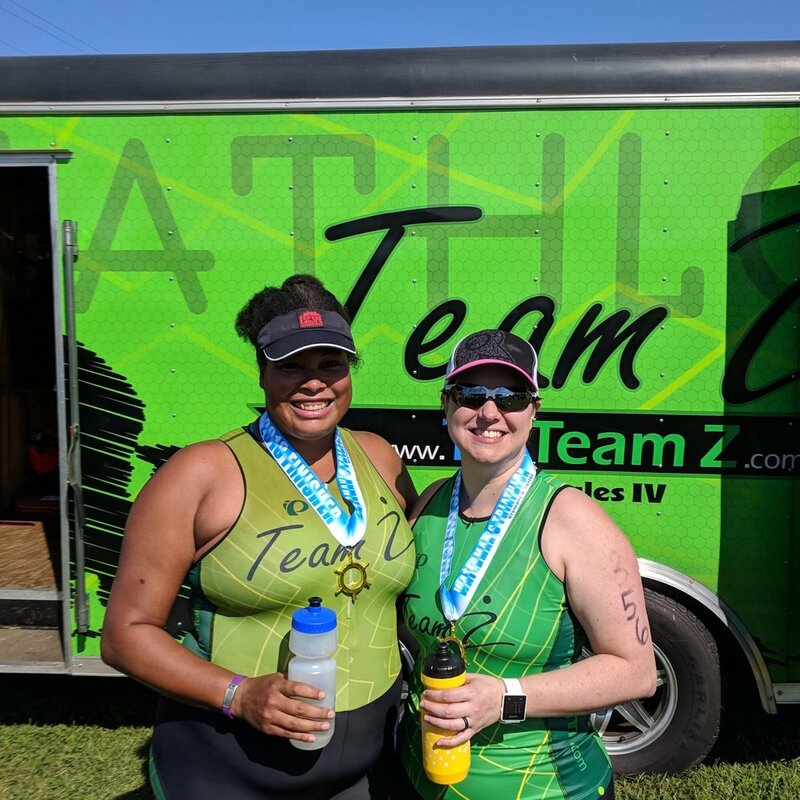 This was my fourth triathlon, and was by far the most fun. Amazing what being well prepared does, isn’t it? I had a peanut butter and banana sandwich 5 hours before go time with some water, then went back to sleep. Kind of. There really wasn't much sleeping the night before. I got up and out of bed 3 hours before go time and into the shower to attempt to wake up. I also had a cup of green tea and more water. I was hoping to....ahem....clear out the pipes, as it were, but my stomach decided to play coy. J took the bike out to the car, and I double checked the gear bag. We headed out, and got to the venue around 5:30am. Parking was across the street from the pool, and was a quick 5 minute walk to check in. I racked my bike, got body marked, and at 6am the pool opened up for warm ups. The water was like bathwater! Over 84 degrees! I did an nice easy 200m of freestyle, then walked through transition areas to make sure I knew where bike out and run out were. When I got to the racks I noticed that I had somehow gotten myself mixed up. I was number 388, but had racked with the 330s, and had 338 marked on my body. Ugh! Race day brain, I guess? I re-racked my bike in the correct place, reset my transition area, and hustled over to bodymarking to get fixed up. Such nice volunteers...although I was feeling pretty dumb inside, everyone was so sweet about helping me. I didn’t do any other warming up, as my lower back had started to feel quite tight when I got out of the pool. J kept assuring me that it was probably just nerves, and I tried walking around a fair amount to keep my mind off it. Around 6:50am I had a fruit puree pouch, and then at 7am there was a violin playing the anthem and the first swimmers hit the water. I only had to wait a little while before the 300s were called. My plan was so start slow and build some speed in the back half. Unfortunately, I ran into the usual pool swim logjam. My first 100 was clear water, and I passed someone quickly. Then I got boxed in and had to hold my pace for another 100 meters. Three of us got to the wall at the same time, but I couldn’t get ahead, even though I’d been tapping feet like crazy. At the wall again one of the guys wouldn't let me pass, so I had to try to push past. Sadly, the three of us were all so close in place that we just couldn't break free of each other. During all of this my stroke strayed nice and relaxed, my breathing was under control, and it never felt like a big deal. I even got to do a fair bit of sighting to make sure I didn't smack into anyone! I hoisted myself out of the pool and headed out to T1, feeling nicely warmed up and ready to ride. I felt good coming out of the water, but definitely a bit ruffled trying to sort things out for the bike. I didn't want to forget anything! Getting my bike off the rack actually hurt my lower back a bit, but other than that it was smooth sailing. The mount line is on a small incline, and for a second there I thought I was going to eat it two feet into the bike. But I didn't, and I headed out for the three loop course. The first straight away is all big ring and excellent for getting up to speed. There's a more than 90 degree turn, and then we're into some rollers. There was nothing super tough, but to keep my cadence I did find myself needing to shift into the granny gear. One more turn, and then we've got a nice downhill followed by "the hill." This hill was getting everyone hot and bothered, being mentioned in the pre race briefing and race reports. I was nervous. And while it got me out of breath and had me working, I never once thought it was too hard. In fact, it felt pretty similar to the hills I climb to get to the trail I train on. It was nice on the second and third loops to know what I was doing. Even better was getting to J and my parents on the straightaway. I got some smiles from J, and my parents had a fantastic sign. Overall I passed a few people, most notably someone on a very nice looking bike with clipless pedals on the hill! But mostly I got passed like I was standing still. I know where I need to put the work in, but I also feel confident that I can get stronger on the bike. I had fun and never had to deal with any negative thoughts like I have in previous races. I was, however, ready to be finished with the bike once I brought it into T2. Considering I don't wear bike shoes, I was a bit disappointed with this transition. I should have been able to run better since I was in my running shoes already. Yes, my rack space was all the way at the end of transition, so I did have to run a long way, but still. The humidity and overcast conditions made me decide to ditch my sunglasses. I grabbed my cap and race belt and headed out. I snagged a water heading out of T2 and had a mouthful. As I headed out onto the run, I heard the announcer call out that the last swimmer was exiting the pool I also saw a course photographer and tried to give a big smile and wave. We’ll see if that means I get a good race pic out of it. My bricks had let me know that by the time I got to mile 1, but legs would be waking up. Except, that didn't happen. I never got rid of my jelly legs, and the humidity was making me gasp. There were some short but steep hills that I found challenging, but I do wonder if I would have felt that way if I was fresh. Still, the prettiness of this course couldn't be beat. If I lived in Reston I would run on these paths nonstop! My shoes were a squishy mess. A sloshy, feet moving, Rocktape peeling off, disgusting squishy mess. I felt like the run was taking a very long time, and I was watching for each each mile marker like it was my job. The course volunteers were fantastic, and there was one wonderful spectator who was out in her front yard playing “Eye of the Tiger!” I had been hoping I'd be able to kick it into gear for the last bit, but it never came together. I never walked. I think however, that if I hadn’t made it a goal not to walk, I may have. I just kept putting one foot in front of the other, but even when I turned the final corner, I couldn't muster up any kind of sprint finish. Even so, I hustled as much as I could and felt so pleased! I crossed the finish line and some cute kids handed me water, my medal, and took my chip. As soon as I finished I started to feel tingly. I was breathing very heavy and all I wanted to do was drink a bunch of water and sit down. And sit down I did! I managed to feel a bit better after I got some water in me, drank a chocolate milk, and walked around a bit. The timing tent was giving out unofficial results, so I got to see my times right away. How cool! Since I knew I wasn’t going to podium (ha!) I decided against waiting over an hour for the awards ceremony. Instead it was off to do the parking lot changing dance and out to breakfast with my family. My brother showed up at the finish line, so it was nice to have him there, too. I have such a great support crew! I loved this race! The RD was so communicative with regard to the sketchy weather. We had some race day magic, though, and managed to only have wet roads and no rain. 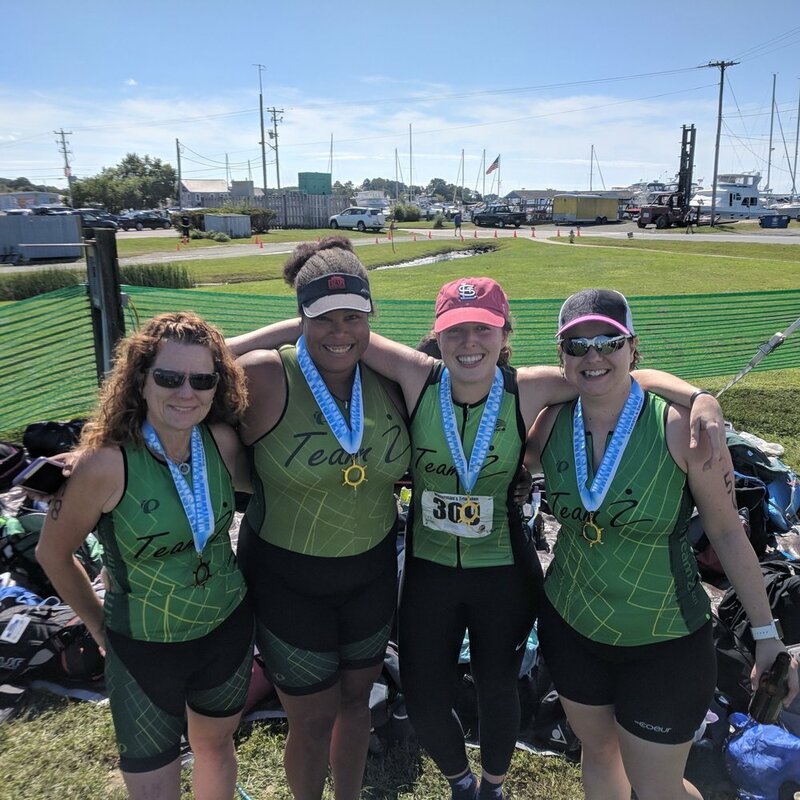 The course was interesting, just challenging enough, and I would recommend it heartily for anyone doing their first triathlon. It was a nice course for spectators. The pool swim has a roped off area where spectators can cheer, and the looped bike course means you can see and be seen three times. Most of the run course is on wooded paths, so that’s trickier, but my parents managed to find a way! I just wish the post race food selection had been better. Bagels and pizza, that's fine. But no bananas? Whoop! All good! The weather cooperated, so the race went on as scheduled. Although the roads were wet, there weren’t a lot of crashes or anything. As much as I might have considered it, I ran every step of the run leg, so I’m so glad I made the goal. And finally: I wound up with a 1:32:48 for the day, which is a PR for the sprint distances. Of course, sprints are always a bit hard to gauge for PRs, since the distances vary more than with other races. Even still: Whoop! Looking at what I could have done differently, overall I think I had good decision making this day. In the swim I could have put on a strong kick and left those guys in the dust, I think that would have come back to haunt me later in the race. It was nice to have a good pace and feel relaxed in the water. I wish I could have been able to drink on the bike, but with my faster than usual speed and the wet roads, I didn't feel comfortable even giving it a try. I don’t know if perhaps I should have biked a little easier? I don't know why the run felt so hard. I train on hills at home, so I'm not sure why they felt so hard. It may have been the humidity, but maybe I overcooked the bike more than i realized. My limiters for this race were my bike handling and strength, aerobic base, and weather. I wish I had more confidence on the bike, so I could have taken the corners a bit better. I also wish my legs were stronger, so I could climb faster. My heart rate felt quite high when running, so I do need to make an effort to do some heart rate training next season. Finally, I wish DC summer had arrived earlier so I could have acclimated to it better. As it stands, I'm quite happy with my performance. I enjoyed every second of the race, did better than I thought I would, and can’t wait to get back to work. So. Many. Nerves. The Reston Sprint Triathlon is tomorrow, and beyond the usual pre-race anxiety, Mother Nature is making for some extra worry. The forecast keeps changing, but right now it looks like a 45% chance of thunderstorms for tomorrow morning. The RD has been great about sending out emails letting us know what’s going on, but at this point we just have to roll with the punches and hope for the best. 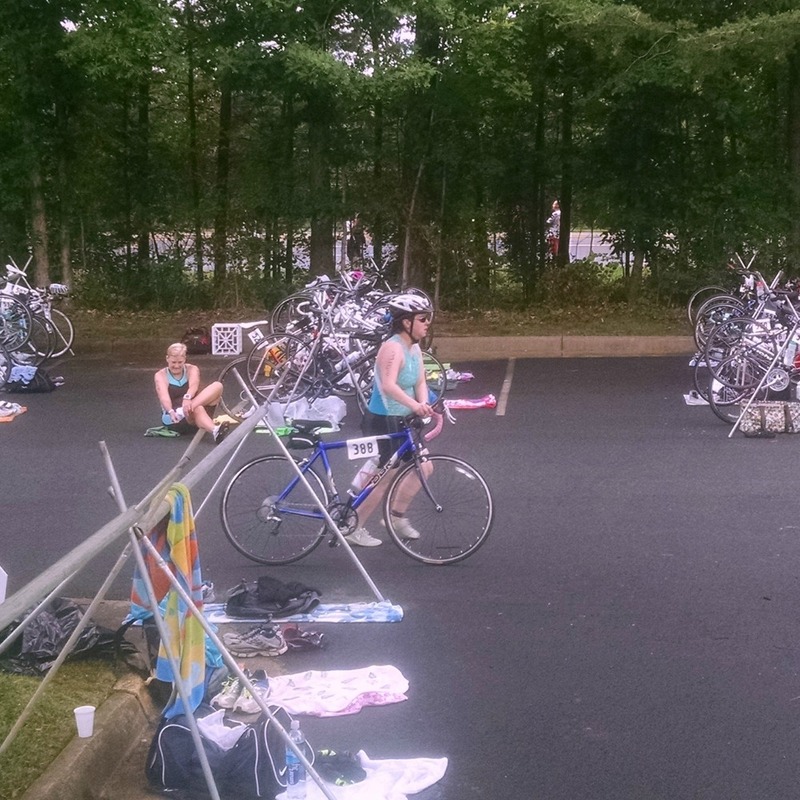 I found the Reston Sprint Triathlon way back in August/September, and there were a few things about it that I liked. First, it is local. And I mean local: 20 minute drive to the start line from my apartment! Second, it is a pool swim. All my other races in the past have been pool swims, and while I toyed with the idea of finding an open water swim race, I thought it might be a bit tricky to find OWS space to practice in before race day. Third, this race is beginner friendly. There are loads of people who show up on all kinds of bikes, and there are plenty of people who aren’t clipping in on the bike or walking the run. All of that together made this race look appealing as my return to triathlon. Participate! This is kind of cheating, since this goal isn’t actually in my control. But I just want to be able to race. Stay rubber side down. If the bike isn’t cancelled but the roads are wet, I want to manage my bike handling in such a way that I don’t crash. This means staying off the painted lines, slowing down through the turns, and being diligent about my surroundings. No walking! In my other three triathlons, I have always walked during the run leg. With the number of bricks I’ve done this prep cycle, I feel prepared to run every step from T2 to the finish line. Go sub 1:40:00. This is the muddiest goal. How do I know if this time makes sense? I don’t. But I want a time to shoot for, and this is the one that I came up with. Assuming I get a swim time of under 9 minutes, and 50 minutes for the bike, that leaves me 35 minutes to complete the run and 6 minutes for both transitions. I know my swim paces, and since this is not open water, I feel confident about my time. 8:30 is where I want to be, but I added a bit of time to account for the timing mats. For the bike, I know how fast I usually am when training, but that includes slowing down for traffic and then subsequently getting back up to speed. This should be interesting, to see how my speed compares when racing! And for the run, it isn’t likely that I’ll get the same run time as I did during my open 5k in April. 35 minutes is hopefully doable. All that said, I’ve been wondering if I should skip wearing my watch. I don’t want the added pressure. Maybe I should just go! I’ll pack it and bring it along and see what happens on race day. As it is, the Vivoactive doesn’t have a multisport mode, so if I choose to wear it, I’ll need to manually start and stop each leg. Ugh...let the overanalyzing begin, right? Are there people who just head into race day without all these worries? Probably not. Being neurotic is sort of a prerequisite for triathletes, isn’t it? Sometimes I’m told to just relax and have fun. But I do get a sick sort of enjoyment out of worrying. I like making lists and cross checking and comparing plans. If I’m not worrying about something, I worry that I’ve forgotten what I should be worrying about! I’ve already been to packet pickup, and I’m about to start packing up my bag and laying out my stuff for tomorrow. I’m #388. I’m excited. And no matter what the course, the conditions, or my body decide to give me tomorrow, I’m going to have a great time! Breaststroke recovery swim with fins, followed by the hot tub. Obviously my Garmin miscounted my laps somewhere, since I definitely got out on the same side of the pool as I got in. I don't know where that extra 25 yards came from. At any rate, a nice swim. It felt good to focus on something different, especially a more lateral leg movement. Toward the beginning my fins were digging into my feet a bit, and I was wondering if I'd be able to swim with them for 45 minutes, but as I focused on my form, the fin irritation went away. Seems it was all mental! Such a gray day, but the rain held off. I went for loops in the apartment complex, but even still my legs felt tired. In fact, when I stopped my left Achilles cramped up something fierce. I stretched it out on the curb and made it home okay, and felt much better after my shower. Still, I've never felt anything like that before and it was not pleasant. Best part: today was this week's short run, and it was 30 minutes! I'm a person who does a 30 minute short run!! I barely looked at my watch today, and that's a good thing. 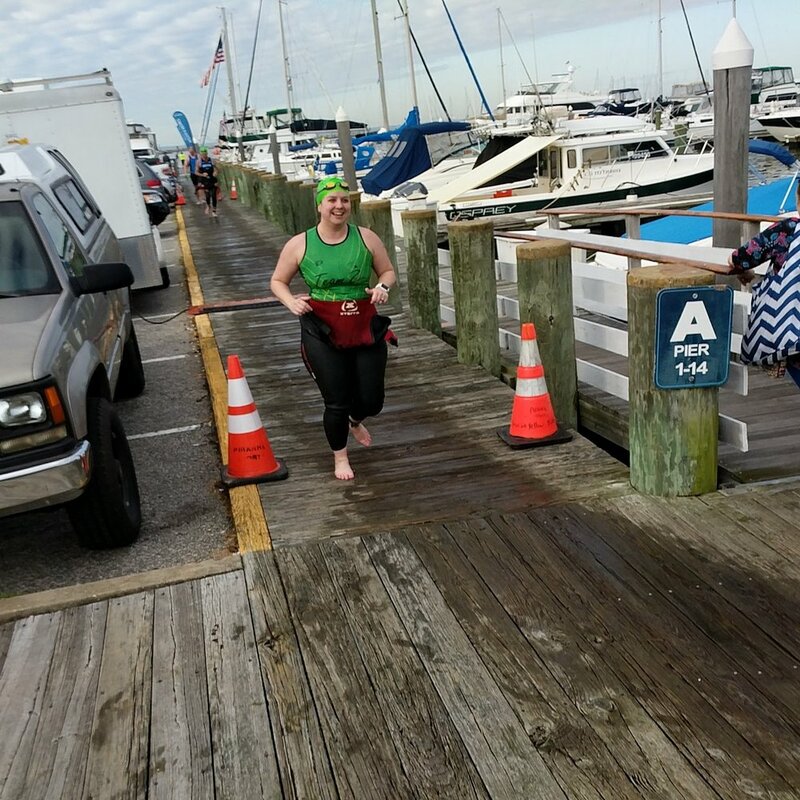 I swam by feel, and didn't sweat each little second, and my reward was feeling a lot more mentally positive during this swim. It was all about form and fun again, instead of time and pace. After the fact I checked out my data, and I nailed all my 50s descending! Nothing super speedy, but each set of 3 got faster. I also brought my water bottle with me to the pool deck. I haven't done that in awhile, not since reading an article by Chrissie Wellington about how you should train like you race and you can't drink during the swim leg. All respect her, but maybe that's something I should only do now and again. I felt much better being able to drink between sets! :) Happy days in the water again!! Noooo! I think my cadence sensor is dead. 3 minutes in each gear all the way up to big ring little cog, then back down. I'm covered in sweat and have shaky legs, so I feel like I worked hard. Will you look at that? A 4 mile long run. And just 7 months ago I was still speed walking. Slow and steady wins this race! I started to get quite warm/sweaty, so my resolve to wear long sleeves as sun protection is going to be tested, I know. But I will remain steadfast and avoid too much exposure. This run was mostly enjoyable, I tried to think about posture and stay relaxed. I actually made it all the way to the 66 crossing, which was unexpected. Besides the kick sets making my foot/ankle hurt, this workout was good. I put a lot of focus on those drills, and body rotation was big in my mind the whole time. Except for the last two of those pull sets, where my back and shoulders were just done. R.I.C.E. day. Blah, I am crap as resting. Week 17 has ended with me feeling quite down. I’m anxious that my tendon will continue to hurt, and that I will lose huge fitness not being able to train for the next two weeks. I’m also strongly reminded of my true goal...to be able to race and be healthy enough to start training for the next one. Just last week I was complaining how that goal was too simple, but here I am, wanting more than anything to follow through and reach that goal. That means not being my own worst enemy, and letting myself heal.